Google Domains left its private beta on Tuesday (in the US, at least) making it possible for "normal" folks to sign up for the service - no invite required. The announcement included a lot of new features as well but the most interesting for me was the inclusion of support for dynamic DNS. I became even more excited when I scrolled further down and saw that Google included an API for updating the DDNS record with a specially-crafted HTTP GET or POST request. 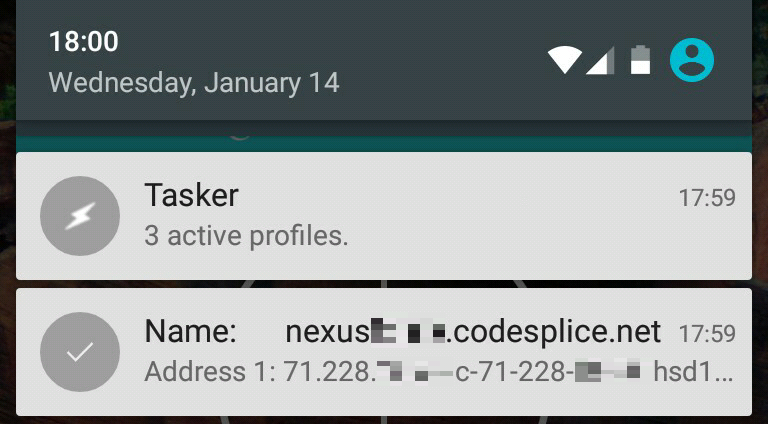 This immediately got me thinking about Tasker, and I set to work on a Tasker-driven method for automatically updating a DDNS record for my phone. This serves no real purpose for me (yet) but it was a bit of fun to work out. Note: This profile doesn't require root but it does depend upon busybox to provide the "nslookup" command. I don't want to run the rest of the task (and submit repeated DynDNS updates) if the current public IP matches what I've already registered. I store the current IP in the %PUB_IP variable. For this If statement, I'm just checking to see if the HTTP GET return does not match the value of %PUB_IP. If TRUE (if it doesn't match), I run the rest of the Task; if FALSE (if it does match), I just skip to the end. 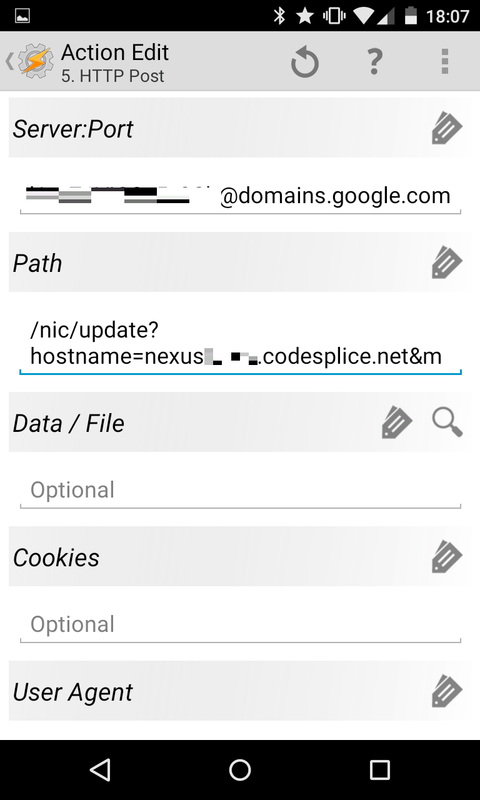 Do Maths:Off Append:Off ] Set the local %newline variable to a newline character (carriage return - just press Enter on your Android keyboard). This will come in handy shortly. 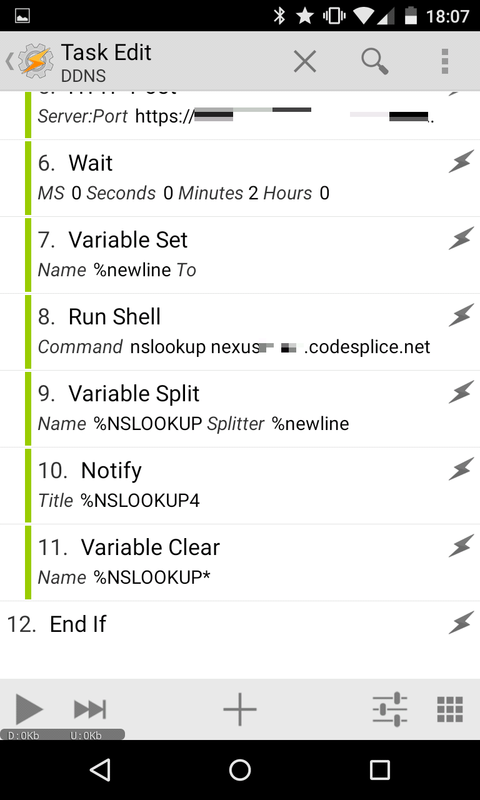 A9: Variable Split [ Name:%NSLOOKUP Splitter:%newline Delete Base:Off ] Split the variable %NSLOOKUP into multiple variables at each newline character. We're really only interested in the last two lines of the nslookup output. 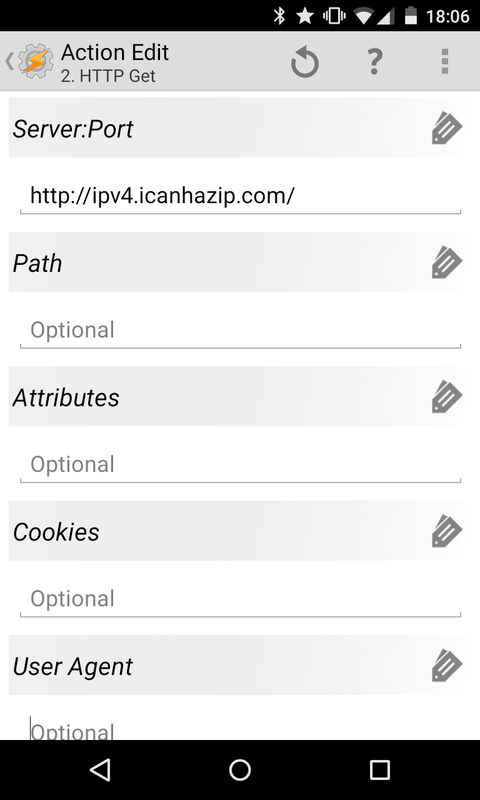 A10: Notify [ Title:%NSLOOKUP4 Text:%NSLOOKUP5 Icon:hd_ab_navigation_accept Number:0 Permanent:Off Priority:1 ] Create a low-priority notification to display the name of the DynDNS record (%NSLOOKUP4) and the public-facing IP (%NSLOOKUP5). 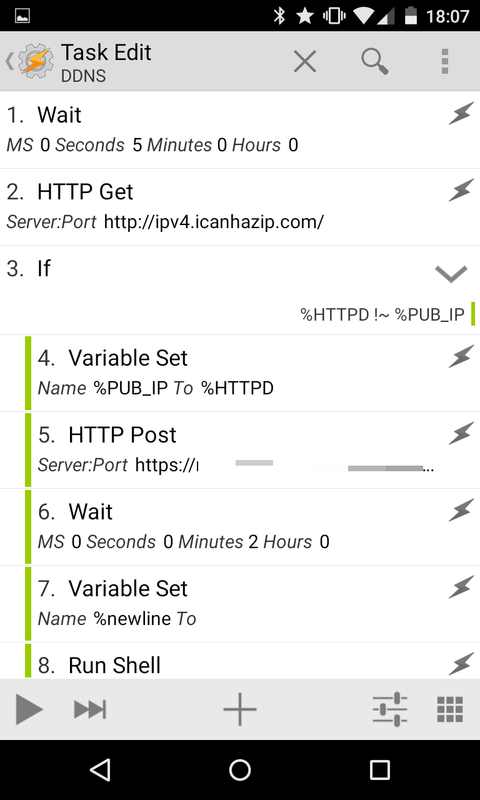 So now, my phone will have a nice dynamic DNS record any time that it's connected to a Wifi network. What will I do with this? Not a clue! But hey, it was a fun little project.